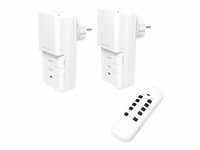 The 3-piece wireless outdoor outlet set from LogiLight is a wonderful solution for the garage, balcony, and terrace. Especially in hardly reachable corners when a wireless outlet can be a huge help. A cover avoids the entering of water.